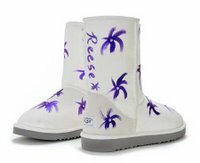 Ugg Australia's 2005 "Art & Sole Celebrity Collection" is currently available on ebay... My personal favourites are the designs by Pierce Brosnan and Reese Witherspoon (below). These kind of charity auctions are great, however I wish that people who buy the uggs would actually wear them instead of storing them away in a collection! Posted by la femme at 8:54 p.m.